Alan Ayckbourn’s latest is another display of his genius. Rather than one play, this is a collection of five shorts. The running order is chosen at random by audience members in the bar about half an hour before show time. Therefore, every night is different: the order in which you see the plays affects your understanding and appreciation of what goes on. Characters may appear in more than one. Names are mentioned that will resonate in other pieces. It’s a circular jigsaw puzzle of entertainment. Each play has a different flavour: there is hilarious mistaken identity in The Politician, when an aspiring actress is mistaken for a call girl; heartbreak in The Star; tenderness in The Judge, spookiness in The Novelist; and thrills and tension in The Agent. 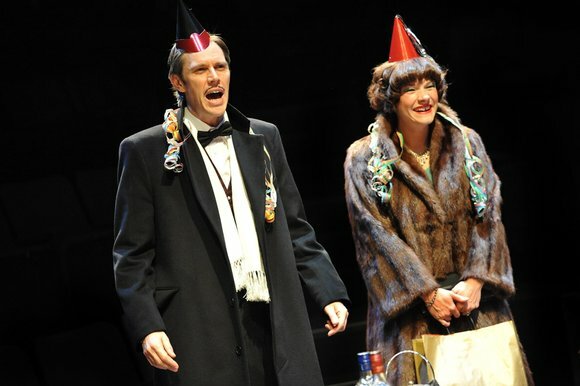 All of them are rich with Ayckbourn’s observational humour, and each of them has its own twist or surprise. As a whole, it’s about human experience in all its colours: love, loss, memory, regret, mistakes, violence, passion, ambition, hypocrisy, lust, fear… Somehow Ayckbourn covers the lot. Life is a dance in the round. The characters reveal different aspects of themselves depending on the circles in which they move. Bloody marvellous. I want to go round again. In a restaurant, members of the Stratton family gather for matriarch Laura’s 54th birthday. It’s a favourite venue and a bit of a family tradition – which is good, because all the action can take place on one set. Alan Ayckbourn’s comedy was first produced in the 90s. Now, 25 years later, it is still as relentlessly funny as ever – along with the usual Ayckbourn undercurrents of tragedy and bitterness. What sets this piece apart is the structure. We join the action during the celebration dinner but then, at other tables in the restaurant, we follow the fates of Laura’s sons. We see one son’s future unfold at one table, and the other’s past is revealed at another. It cuts from one to the other seamlessly and we are never confused about where we are in the timeline. The ensemble works excellently to reveal these characters. As selfish Laura, Sarah Parks brings a deadpan humour to the callous observations, balanced to perfection by “EveryDad” Gerry (the superb John Branwell). Laura’s neglected son Glyn (Richard Stacey) matches her in monstrous selfishness, and one really feels for his good-natured wife, Stephanie (a delightful Emily Pithon). Over-indulged son Adam (James Powell) is less abrasive than his brother, a sort of hapless twit in Tweed who, after some hilarious misunderstandings, falls for the dubious charms of hairdresser Maureen (Rachel Caffrey, bringing bathos and colour to the proceedings). For me, the touch of genius comes in the device of having one actor play all the restaurant staff. The versatile Ben Porter is a scream as a range of waiters in dodgy wigs and Greco-Albanian accents, mangling the English language, bursting into incomprehensible song and making gestures, lewd or threatening as the case may be. This keeps the play firmly rooted in comedy even though some very dark things are said and indeed happen, off-stage. The theme is reflected in the title. It is about recognising moments of happiness when they occur rather than in bittersweet retrospect. Which is, of course, easier said than done. But while you’re in the theatre, revelling in this virtuoso display of acting and comedic brilliance, for that couple of hours you are enjoying the time of your life. Three Christmas Eves, three kitchens, and three couples. Ayckbourn’s play from the 1970s seems deceptively straightforward. Each of the acts is an exercise in comedy of some kind: comedy of manners, black comedy, slapstick and the traditional bringing authority figures into ridicule… to name but a few. By the end of the evening, the play has charted the rise of petit bourgeois Sidney, the upwardly mobile shopkeeper and small businessman. Along the way he becomes a monster and a boor, but the others, the bank manager with whom he invests, and the disgraced architect desperate for work, have to dance to his tune – or rather freeze when he stops the music. Within the couples, fortunes rise and fall: Hopcroft’s cleaning-obsessed wife becomes his equal; suicidal Eva reins in her philandering husband and takes charge of his business affairs ; and Marion, the bank manager’s wife sinks from snobby disdain to rampant alcoholism. Yes, there is darkness permeating their lives but for the audience it is a treat to sit back and watch as this finely tuned clockwork reveals its delights. As Sidney, Ben Porter stands out, at first neurotic and slimy, he gains confidence as his empire grows. Laura Doddington is a hoot as downtrodden Jane who is able to enjoy herself when Sidney gains other victims to bully. Ayesha Antoine’s Eva gives us contrasts: the strung out on antidepressants woman at the start could not be more different to the hardened and focussed wife at the end. And yet it is in the second act, in which she doesn’t say a word, that she really shines as each mute attempt to top herself with whatever’s handy in her kitchen, is hilariously and unwittingly thwarted by her unwelcome guests. Richard Stacey plays her husband Geoff, perhaps the least exaggerated character of the bunch and the architect of his own downfall. Bill Champion brings a note of pathos to befuddled bank manager Ronald, still puzzling over why his first wife left him, and Sarah Parks’s Marion descends into drunkenness with a startlingly well-observed performance. I’ve seen this play several times but never before in a production directed by Alan Ayckbourn himself. Here the class distinctions seem sharper, the darkness casts a longer shadow. When first produced, the play must have seemed prescient about the rise of the Thatcherite, the businessman over the professional and the powerful. Now it seems to hint that the banks are hopeless and we must all kowtow to private enterprise – the power is in Hopcroft’s greedy hands and he is a brute without taste, grace or concern for public welfare.